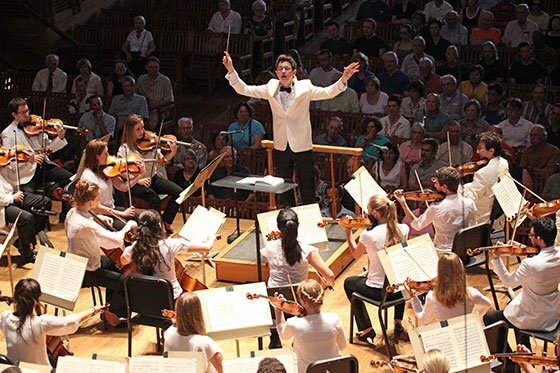 Monday night the Tanglewood Music Center Orchestra took to Ozawa Hall stage for a centennial celebration of Benjamin Britten’s birth. Three different conductors led works of Britten and Shostakovich. Ciarán McAuley conducted the opener, Britten’s Pas de Six from his ballet Prince of the Pagodas, op. 57a. In six continuous sections, this dance reflects Britten’s fascination with the gamelan music of Bali, heard during a 1956 vacation, and is considered a representative sampling of the full ballet (some 100 minutes in duration). The large percussion section imitates gamelan music, and the composer used both the heptatonic and pentatonic scales typical of gamelan music (although whether the scales in Britten mark the difference between mortal and divine realms as in gamelan music, I cannot now say). From the initial Entrée through Variations I – III (Pas de deux; Girl’s solo; & Boy’s solo), to the concluding Pas de Trois and concluding Coda, this is complex and densely-layered music. McAuley gave clear and incisive direction from the podium, and the orchestra was highly responsive. Throughout there was a keen sense of rhythmic integrity; each of the movements retained a sense of momentum, but the melodies were never breathless nor rushed. Thomas Hofmann, seated concertmaster for this concert, performed the violin solo with agility and a good sense of phrasing. Alexandre Bloch conducted a Laura Strickling, soprano, and a reduced, string chamber orchestra in Britten’s Les Illuminations, op. 18. Dating from 1939, this twenty-one-minute cycle sets poems by Arthur Rimbaud and creates a “parade sauvage” (wild parade) where reality and illusion vie for our attention. Bloch was a dramatic and emphatic conductor; Strickling impressed with her powerful and expressive voice across a large range, her variety of timbre and character, and playful demeanor embodying lighter moments of this song-cycle. Hofmann, playing the violin solo during “Antique,” matched the singer’s phrasing in his own, emotion-laden delivery. The cello solo heard during “Interlude,” performed by Louise Grévin, was gorgeously throaty. This was a transcendental—dare one say illuminating?—performance. Following intermission, Stefan Asbury led the full orchestral forces in Shostakovich’s Symphony No. 11 in G Minor, “The Year 1905,” op. 103, a 65 minutes behemoth, it stretches as far as the Soviet Union and nominally embodies the Russian masses, the rise of Socialism, and the Zeitgeist of the Stalinist era. Jay Goodwin, a former TMC Publications Fellow, offers an insightful note in the program discussing the ambiguity in this music—simultaneously a glorification of the Bolshevik Revolution, a model of Social Realist art and a winner of the Lenin Prize, and a response to the Hungarian Uprising of 1956. While Goodwin is right to point out the self-deluded nature of the Soviet regime which could embrace this music built upon a layer of folk, revolutionary, and prison songs from late-nineteenth and early-20th-century Russia, there is something else here, too: except for small moments, this symphony creates a sonic world sounding far different from the canonized fare of Shostakovich. In addition to everything else, I think this work encodes Shostakovich’s own anguish at historical and political events and his tortured (more so than usual) efforts to compose a response. The four movements, played attaca, take us from The Palace Square to The Ninth of January, pausing In Memoriam before concluding with The Tocsin (“Alarm Bell”). From the Brucknerian opening, here played without vibrato, tension mounts and a vivid portrait sounds before us. Nearing the end of the first movement, the flutes in tandem, then the trumpets, present an open melody in parallel motion, recalling the music of Aaron Copland. The change from the forte martial music of the second movement gave way instantaneously to the piano elegiac music of the third. 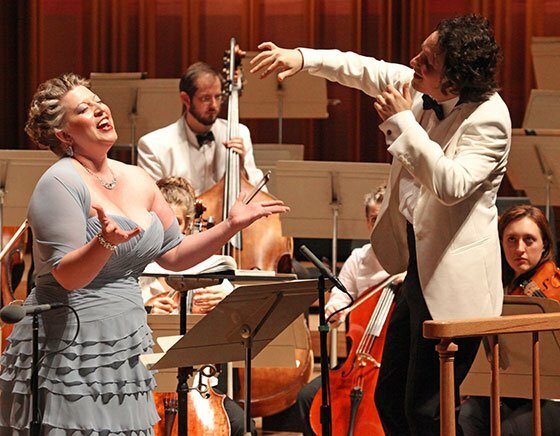 This is music of raw, unbridled power, and that is precisely how it was performed on this concert. This revolution will be heard, and when it is played with such passion and precision, such incision and vigor, it absolutely should be heard. The sustained applause which recalled Asbury to the stage and which greeted flutes, trumpets, violas, timpani, finally the amassed orchestral forces, was richly deserved. I much appreciated this review and especially noting as Mr. Prince does how deeply heartfelt this Shostakovich symphony is and that one notes was composed not that far off the time of the mid-fifties Hungarian uprising and suppression. I for one have always regarded this composer’s symphonies as amongst the finest of the last century and always felt the eleventh was one of the best if least-heard especially with the long sustained and haunting largos he’s famous for. Kudos for the TMC for taking this masterpiece on which I hope the BSO will tackle one day in Symphony Hall.